Sometimes it is hard to find the right words to try and introduce people to new music. If you try too hard you can oversell and turn people off. If you don’t do enough to sell it people just won’t be interested. It’s a fine line that I try to remember and find just the right balance. Today is not one of those days. The following pitch will be loaded with praise in regards to the talent that is Purcell, OK native Parker Millsap. Still shy of his 21st year on this big ball of dirt that spins around the sun; Millsap has proven he has a talent that could cement him as one of the next big stars to come out of Oklahoma. His debut album Palisades generated a buzz that garnered him attention from a few major players in the Americana/Folk music scene in 2013. Parker and band mates Michael Rose and Daniel Foulks opened several shows for Old Crow Medicine show and were able to showcase themselves to a much larger and diverse crowd than they typically played to at festivals and venues in their home state. That exposure, coupled with an incredible new album that was released in early February, should continue to propel Millsap and company down a road laden with much success. The self-titled album has captured Parker and his music perfectly. Upon hearing the raspy throaty vocals and hearing the well beyond his years storytelling, you instantly forget that this guy is only 20 years old. 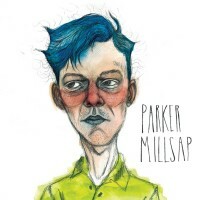 With this album Parker Millsap has created an impeccable meshing of Americana/Folk/Country /Blues and Rock that defies labels and challenges the listener to keep up as he crosses genres from track to track on this album. With songs about everything from lovable losers, loving couples, and even Jesus loving truck driving travelling evangelist killers… yep… He manages to create characters you can easily relate to. Parker Millsap has presented a convincing case for being considered next in a line of very talented singer/songwriters coming out of Oklahoma. Those that have witnessed Millsap and his accomplices slay crowd after crowd are often ready and willing to testify to that fact. The jury may still be out, but judging by the evidence presented, things are looking very promising for the young Okie.